Welcome to all Spintires: MudRunner fans! Get ready to hear the latest news related to our favorite Spintires: MudRunner American Wilds edition. We will review the most important information relying on players’ community. It is amazing how many people have tried Spintires: MudRunner – we are honored to say that the sales exceeded one million. It is a wonderful approval that a new game edition was needed and long-waited. 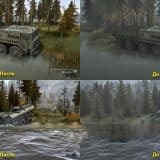 But let’s come back to the update about Spintires: MudRunner American Wilds. Previous time we were listing the best game mods according to our colleagues. This time we are interested in sharing some insights about the American Wilds DLC itself. We are sure that you are craving for more information, so let’s make things clear! First of all, the official name of the USA game version will be MudRunner American Wilds. This will be an additional pack for Spintires: MudRunner. Talking about the compatibility, the extension will be introduced to PS4, Xbox One and Nintendo Switch consoles and as well to PC. You will need to be patient about the release date announcement – the exact date will be specified in fall. 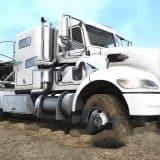 MudRunner American Wilds DLC will include everything you were wishing for, such as additional sandbox maps and vehicles approved with licenses. The names will be announced in the nearest future! Talking about the price, you will be able to choose between the expansion pack only and the full Spintires: MudRunner American Wilds edition including the original Spintires: MudRunner. Pricing will be specified in the future too. Currently the game and especially the vehicles are not ready to be published but hopefully we will be able to share some screenshots soon. Please keep calm and give some time to finish up the most important parts of the upcoming extension. Trust us, it is definitely worth waiting for Spintires: MudRunner American Wilds download!